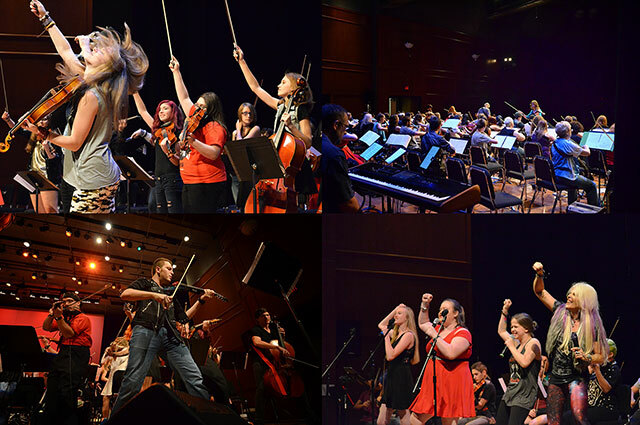 MWROC is powered by Electrify Your Symphony, the revolutionary music education program developed by Mark Wood, and supported in part by The Mark Wood Music Foundation. It’s so much more than the music. Here at MWROC Music Festival, our mission is to consistently celebrate creative music-making and the showcasing of great talent. MWROC Music Festival is a week-long music education experience where attendees are immersed in cultivating self-expression through improvisation, performance, and the latest technology; and where they get to put all their new tools to use in a grand finale international rock orchestra concert event – open to the public – on our last night. Register early and take advantage of our low monthly payment plans (NO added fees or interest). Get a multiple person discount (great for family members), and we have excellent group rates for educators! We’ve helped hundreds of musicians and singers to discover their own voice – not only as players but as PEOPLE. We believe that the art of building confidence in your own unique powers of self-expression is KEY to making your way in the world. Come to MWROC Music Festival and celebrate the greatness of YOU! In-depth workshops for string players, vocalists, guitarists, electric bass players, and a select group of brass/wind players. Expand your creative horizons and learn groundbreaking methods from Mark and his world-class team of Artist Mentors. Improve your technique and increase your musical knowledge. Learn critical team-building skills by working with musicians and singers from all different backgrounds and abilities. Combo Concert Main Stage Focus. Attendees present their own Combo Concert towards the end of the week. Combos are small ensembles led by individual MWROC faculty. International symphony orchestra experience. Attendees spend a portion of each day rehearsing for a massive concert event, open to the public, on the last night. Placement auditions are submitted prior to camp, and attendees are assigned to either the Beatles (intermediate) or Zeppelin (advanced) orchestras. Faculty concerts every night, where you’ll experience what makes our team of Artist Mentors so incredibly special. Expanded teacher training sessions with Mark Wood and his new curriculum. Cafe Rock and Wreck. Our evening gathering devoted to individual performances, group jam sessions, and experiencing true musical camaraderie. Flexible schedule for 18 and older. Free gym time in the campus fitness center. Lots of opportunities for jamming and improvising. Whether it’s during our workshop time or on your own, we build in extra time in the schedule devoted to testing out the skills you’ve learned on any given day. Movement classes to make you a better performer. After-show dance party, complete with DJ, pizza, and cake. Drawing on their substantial knowledge and expertise, our incredible faculty offers an amazing selection of practical courses that will enhance your skills on every level and in every performance environment. 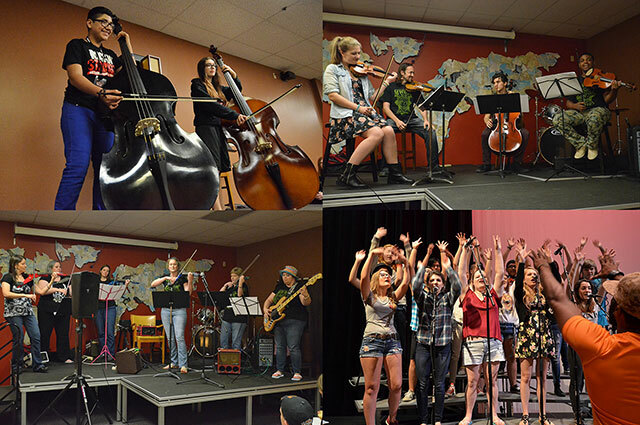 Days are filled with a wide variety of classes for attendees to choose from and are capped off by faculty concerts every evening, after which attendees and staff get together in our “Cafe Rock and Wreck” for individual camper performances, group jam sessions, free gym time, and experiencing true musical camaraderie. In addition to all of our great classes, you will spend a portion of each day rehearsing for our massive concert event, open to the public, on the last night of MWROC where you can demonstrate all the skills and techniques you’ve acquired during the week. Everything you learn will not only enhance your classical/traditional training but will give you many new and exciting musical tools to help you grow as a unique artist on your own terms. Here are some examples of what you can expect to learn in our classes. Leave your comfort zone at home. We give you empowering tools and techniques to express yourself creatively on the highest level possible.